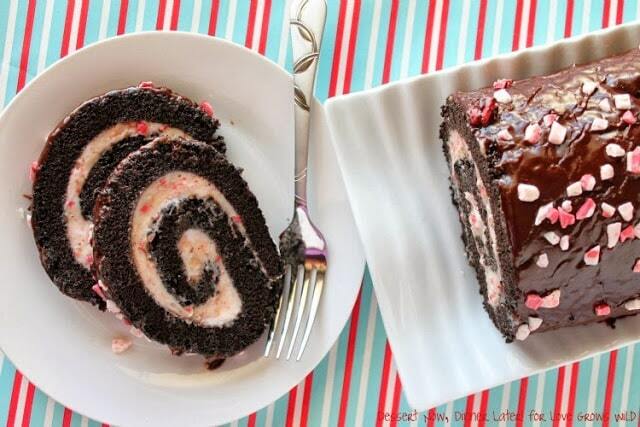 Dark Chocolate Peppermint Roll - Dessert Now, Dinner Later! Oh my word, are you guys surviving this holiday season? It’s been crazy hectic since Thanksgiving & hasn’t stopped for us! So if you have anotherholiday party or two to attend still, you might want to whip up this delicious Dark Chocolate Peppermint Roll. It’s beautiful to look at & tastes divine! Not too minty, and the cake is moist & flavorful. Plus it makes your mouth water just looking at it right? If not, then I am not doing my job right & I better work on my photography & food styling, stat! Anyway, if you are a chocolate & peppermint fan, then this is the dessert for you! You’ll be glad you tried it! Recipe added 9/10/15. Also seen on Love Grows Wild. 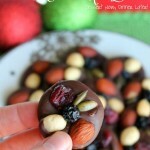 Looking for a great holiday dessert? This beautiful Dark Chocolate Peppermint Roll is sure to be a show-stopper! DARK CHOCOLATE CAKE: Pre-heat oven to 350˚F. Grease & flour a jelly roll pan. I like to grease & flour the edges & place a piece of parchment on the bottom. Prepare a kitchen towel to roll the cake in, by heavily dusting it with powdered sugar. In the bowl of a stand mixer, with the whisk attachment, beat eggs, sugar & salt until frothy & pale. Add the oil & buttermilk until combined. In a separate bowl sift the flour, cocoa, & baking powder, twice. Add to wet ingredients & mix until just incorporated. Pour batter into the prepared jelly roll pan. Bake for 15 minutes or until the cake springs back when touched; alternately check doneness with a toothpick, that when inserted in the center, comes out clean. Let the cake cool for 2 minutes. Then flip it out onto the powdered sugar dusted towel, remove the parchment (if you used some), & then roll it up in the towel while it's still hot. Allow to cool completely. PEPPERMINT BUTTERCREAM: Combine all ingredients & beat until you reach a smooth, spreadable consistency. Set aside until ready to use. CHOCOLATE GLAZE: Heat chocolate chips, heavy cream & vanilla in a bowl in the microwave until melted & smooth when stirred, about 30-45 seconds. Don't let it burn though! Add powdered sugar. Stir. Add warm water until desired pouring consistency (I like to keep mine semi-thick still.) Set aside until ready to use. Unroll the cooled cake. Spread Peppermint Buttercream on the inside of the cake, leaving a light coat where the end of the roll will be. Tightly roll cake into a spiral. The tighter you can get it, the better it will look. Place filled cake roll onto a wire cooling rack that has been placed inside of a baking sheet. Pour Chocolate Glaze over the top of the cake. I start on one end, & let it gather up & naturally drip over the edges as I slowly work my way towards the other end. 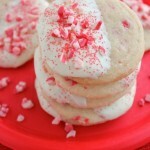 Sprinkle extra peppermint chips on top while the glaze is still wet. Allow the chocolate to set before slicing & serving. You can store this at room temperature or in the fridge, whichever is your preference. OH. MY. GOODNESS. I’m in LOVE!!! Can I feature this at the end of my peppermint week? Sure thing Kaylynn! I forgot you were having a peppermint week. I need to stop by & check it out! 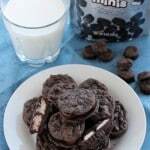 This looks delish and I am not a dark chocolate fan. My MIL will LOVE it! This looks so beautiful and tasty! Thanks for sharing! Amber, I just found your blog from My Name is Snickerdoodle. I saw your peppermint cake roll and thought it looked so yummy so I clicked over. We were in the same ward at USU. 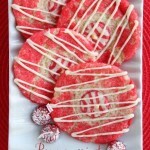 My sister and I have a recipe blog over at http://www.leeshandlusrecipebox.com – I’m going to start following you! Your blog looks awesome! So glad I found it! Hi Lindsey! I remember you! I’m struggling to find any social media buttons on your blog. Do you have any? I see Pinterest but that’s it. Glad you found me! Blogging is crazy and fun, isn’t it! Yes, I’ll email you. 🙂 So fun to find you! Yes, blogging is crazy and fun! Hope you are well! What size jellyroll pan do you use? I used a 10×15 and my cake layer came out way to thick and then broke several places when I tried to unroll it (yes I let it cool completely)…help! This is a thicker jelly roll cake than say a pumpkin roll. The size of pan that you used is just fine. I’m not sure how to help. Have you made a jelly roll before? You have to be gentle when you unroll it and fill it. Another possibility is that the cake could have been over-baked. Other than that, I can’t think of what went wrong, but I’m sorry you are having a hard time!